I'm using SMD elements, which I would place on the top layer. Also I would create a ratsnet area as GND on the top layer. I would create some ratsnet area for the SW pin, the output inductor pins and the boost capacitor pins. In that areas I would put some vias and connect them with a ratsnet on the bottom layer. I'm not quite sure if this is correct so far or if I misunderstood the example. Because then I do not understand the 'additional vias on the GND' of the capacitors. If the GND area should be on the bottom layer, what about the trace from the SW-pin? Vias have inductance, with a few nH each (depending on the size and this can be calculated). If you parallel vias, you are also paralleling their inductance and so by doubling vias, you half the inductance. Parasitic inductance creates further losses and lower rise times in switching applications, so a decrease in inductance is a good thing. Vias also have a small amount of resistance also, so parallel vias also decreases the resistance. The trace from the SW pin would go on one of the internal layers or bottom layer if using a 4 layer design (SIG-GND-PWR-SIG). If you have a 4 layer stackup, the ground layer is probably on one of the internal planes (ideally). If your using a 2 layer design then the SW trace would go on the bottom layer, and the GND would be on the top. I would put Gnd layer on both sides where ever there is not a signal. 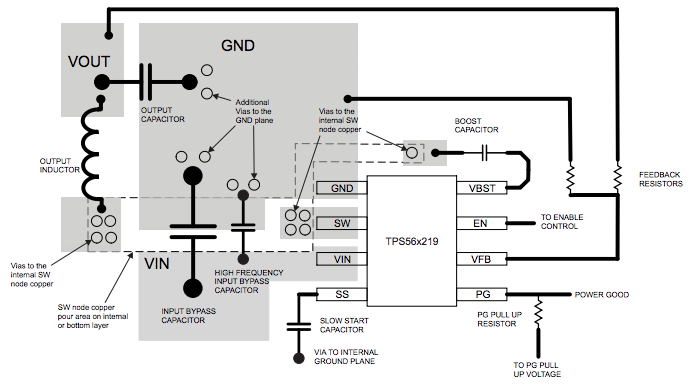 Connect the layers with vias named Gnd. Lots of Gnd coverage, lots of vias. More Gnd never hurt anything, and it's less copper to remove from the copper plated board. I buy boards from iteadstudio.com regularly, I leave all Gnd on I can. Not the answer you're looking for? Browse other questions tagged pcb pcb-design ground pcb-layers or ask your own question. Is connecting two GND planes with vias a standard practice?